Well, hello there, I'm Pepper Pomeroy and I'm here to talk about my new series. I live in the Chicago area and I was downsized from my last job as an event coordinator. While I was hitting the want ads and the job boards, my sister's boy friend, Warren Evans asked me to help him create the perfect romantic proposal for him to pop the question to Felicity-that's my little sister. Like so many couples today, Felicity and Warren are inseparable. It's sort of a forgone conclusion that they are going to get married and Warren-like a lot of romantic men-wanted the proposal to be really special. Warren told me he rented a private jet to fly my sister off for a romantic weekend. My job was to decorate the plane's interior, hire a videographer to record the whole thing and basically ensure that my sister got the proposal of her dreams. Things were going along perfectly until I went looking for the flight attendant and discovered a man passed out in the third stall of the ladies room. Before I could call security and report him, Felicity arrived and I rushed off to ensure the proposal was perfect. What a mess. Now everyone in the hanger was suspect except me, of course, because I found him. But the police being suspicious by nature decided that it was Warren who killed the guy. Now, I have to ask you, who stops to kill a guy before asking the love of their life to marry them? But the homicide detective guys aren't thinking clearly and it's up to me to prove my little sister's fiance is innocent. There's just one small problem--okay maybe it's a big problem. I'm not really what you would call a detective. But if I can plan an event, I can unplan a murder...right? Killer Characters is giving away a free book a day - so here is my question to you. What is the worst wedding disaster story in your life? 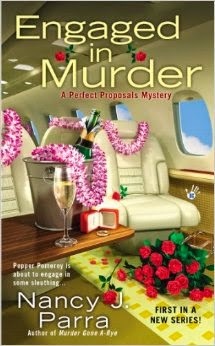 One person will win a copy of Engaged in Murder, the first in the Perfect Proposal mystery series. Leave a comment to win. Good luck! Well, guys - no one is perfect. I had this done and scheduled to go up at midnight- I just found out I never hit publish- sheesh- palm to forehead. As a minister, I can tell you some great stories about wedding "excitement"! A winner was the couple who decided to get even with their families by having the whole service be a nasty jab at them. No amount of common sense would sway them. Then the actual day of the wedding arrived and they (at least the groom) had second thoughts. He was so wound up he passed out. That is a story. Weddings can make people to crazy things. I'm reading this now and I'm enjoying it. I can't think of any wedding disasters, just minor annoyances, so I'll skip that question. Oh wait, how about the guest who got drunk and smashed the groom's special chocolate cake that the bride had baked especially for him? What was her problem? Thanks! That is a story. Poor cake. At the wedding of one of my friends, the groom got dizzy and started swaying. We thought he was going to faint. Luckily he didn't. Thank goodness he didn't. I always try to remind people to bend their knees. If you straighten them for long you faint. These stories are all so similar. People don't need permission to be rude. Poor Bride. What a lovely, lively cover! And the story sounds like a juicy summer read… *trots off to load the kindle* Sadly, our wedding was the most boring wedding ever. We were students, didn't have a penny to our names, and when we announced that we were going to get married, we heard this question about three times daily: "Do you HAVE to get married?" aka "Did you knock her up?" But that wasn't it at all. We just felt that being married and living together would feel a lot better than doing it unmarried. Deb, that is funny and kind of awww- It sounds like something I would do. Now I'm going to have to wear flats to Felicity's wedding-just in case. My boyfriend at the time drank and then started throwing things down the bridesmaids dresses to see if they could catch them with their attributes. It was his cousin's wedding no less, so it didn't go over too well with his family as you can well imagine. That is awful. Hopefully he either is no longer your boyfriend or has given up drinking. At my sister's wedding this past fall, her friend hurried to get her into her dress, ripping part of it in the rush. We ended up having to sew her into her dress-she was not happy. I've learned ot always have needle and thread ready for emergencies. It's all in a day's work for a proposal planner. At least you saved the day! I'll never forget a wedding I attended my Junior year in college. Three classmates and I went to see our fellow classmate Mary get married. She was a beautiful bride...but oh my word-she walked down the aisle, which had a white plastic runner on it and her heels kept getting caught-she was also about 8 months pregnant and boy did it show. Then there was a little kid running around the organist. We all sighed, but held it together until the organist began to sing-off key and cracking. I should point out we were all theatre majors who could and did sing well. We were aghast. As for wedding proposals, I've only had one. He got down on bended knee right in front the phone at work and asked me to marry him. However, he was a patient in the forensic unit of the psychiatric center where I work. I'm still single. LOL- Katreader, You have a great proposal story!! Wonderful! It's nice to know most go off without a hitch. Mine!! And ironically we were just reminiscing about it this morning!! The band was late, the family "friend" who swore she could cater our reception couldn't keep up with preparing and serving the food so some people ate while others went home hungry, my photographer took pictures that I could have done a better job doing. I actually cried during my own reception. The good thing is that 20 years later we can look back and say it was an awful day, but at least we're still very happily married!! Congrats on the happy marriage!! So sorry everything went wrong with the wedding, but so very glad to hear you are happy. You inspire. No wedding disaster for me or friends but have enjoyed reading the other comments. Love this series and look forward to reading the next book in the series. Oh, I love the premise for the new series, Nancy! I don't have a wedding disaster story. A cell phone rang during my sister's wedding ceremony, which was a bit tacky. As a bridesmaid I noticed, but thankfully I don't think she did. The story of my proposal is quite pitiful, but despite it, I said yes and we've been married for 12 1/2 years. Thanks for the chance to win! Congrats on your happy 12 1/2 years!! My brother in law fainted during the ceremony. My poor sister was very embarrassed. Poor Bride...Let's hope that doesn't happen to any of the grooms I plan proposals for. It was almost time for my wedding to start and the flowers weren't there. They claimed they had been at the church at the proper time and no one was there. I had been waiting for them. So everyone is seated and my mother is putting flowers on the altar, etc. And, the person who was to walk me down the aisle was late. Since my father was dead, and my brother was the best man, we had asked my sister-in-law's brother to do it. Instead my brother grabbed a coworker of his and my future husband to do it. He sort of ran me down the aisle. But everything worked out okay. We've been married for forty-two years so far. Congrats on the happy 42 years!! No wedding disasters--just marriage disasters for me. It took me 3 times to finally get it right. So glad you're happy now!! Ha! Hubby to be, his mom, had a friend that made "wonderful cakes", and she wanted her to make our wedding cake...I met the lady, told her what I wanted....went home. Night of the wedding, after...cutting the cake......was doing the he/she slices of cake, and my first bite..I KNEW it was a banana cake! I HATE bananas!!!! swallowed...said nothing..til later and asked my new MIL- why is that cake banana? She says, well, I knew you would'nt like it, but it is his favorite!! HAHA! Guess how that relationship is not going, after 30 yrs!!!! Hubby and I are just fine..MIL..well......!!!!! So sorry for the MIL-but glad you are going strong! The comments are good, aren't they? I've been married for 20 years, but am still wedding obsessed. I watch Say Yes to the Dress and those type of shows all the time. I've been married for 31 years. We had thunderstorms the day of wedding with some flooded roads, the pianist lost a piece of music for the soloist, and one bridesmaid was not able to attend.... but it was still a great day. Thanks for sharing! Sounds like all in all it was very successful! Excited to read the first in a new series. I've enjoyed Nancy's other series. Thanks for he information. I had paid for my maid of honor and bridesmaids to have all their hair and make up done by a professional. Everyone looked lovely. Then the maid of honor and one of my bridesmaids began to argue right before the wedding started. They out of nowhere fist began to fly , hair and makeup was a mess and one dress was torn. I could not believe my eyes. I was so upset and the wedding was starting in 5 minutes. My hairstylist jumped in and made them stop but they still were throwing punches. She got hit and so now 3 people had bruises and torn clothing. Mind you these are upright people from good families who never exhibited this type of behavior. It gets worse, all through the ceremony they threw dirty looks at one another and ignored what was going on at the alter. It was so awful. Then at the reception , one began the fun by throwing a glass of punch on the other, wiping out my grandma's beautiful handmade tablecloth and my gorgeous flowers and cake table. At that point I just began to cry and ran out of the room . My groom had to separate them and sent them both packing. My Mom gave them a good talking to ad they were not allowed to stay at the reception. I eventually stopped crying and returned to the reception with my groom and continued on with my head held high. I always said I would never have another wedding and I never have! Yes this is a true story. My goodness, Lexie! I'm so sorry. What a mess. Thanks for sharing. There are two that come to mind, the first nearly broke my heart and the second nearly had the bride's family pulling our hair out. The first was over twenty years ago when one of my nieces (I have over 20) was in the bride's room of church and I was plaiting flowers in her cornet and I asked her one more time if she was sure this was what she wanted. They had met only the month before. She looked up at me in the mirror and said, "Don't worry so much. If it doesn't work out, there is always divorce." I wanted to grab her up and run. Twenty-two months later, just after her twenty-first she had a beautiful newborn and divorce papers that the ink was barely dry on. The second was also another niece. We had been working on this wedding for nearly ten months everything was ordered, delivered and prepared. For days before the wedding the bride's dress arrives and there is a huge stain running from back waist all the way down the ten foot train. It looked as tho someone had taken paint and brushed it down in a straight line. Did I mention they were having a mid evil themed wedding? We called the dress maker who said she was sorry, but she could do nothing to repair the dress in time for the wedding as planned. She would need two weeks minimum to redo the dress and that was with her and her assistant working around the clock. She suggested we get a off-the-rack dress. My niece was in tears and we were in panic mode. My sister and I stepped out of yet another bridal shoppe looking for another dress when my neighbors mother stop's us and tells us that if there is more material the train panel could be replaced. She and her daughters picked up the material and dress as we continued to shop. The next morning when she knocked on my door she was holding a beautiful, unmarred dress. The only thing was the train was only six feet now. We owed them the world. We returned the dress we purchased and gave the money to them and sat them at a place of honor at the wedding the next day. Thank God for dear friends with talented family members. What a story- the first seems common with some people. But the second just warms the heart. My half-sister got married when she was about 8 months pregnant, with a dress with spaghetti straps and she didn't shave under her arms. But she and her husband have been married about 30 years or so, so their relationship must be good. Went to a friends wedding and the power went out, the groom and his best man were stuck in the elevator. If that wasn't bad enough the florist delivered the flowers to the wrong church and the church's air conditioner broke down on a 95 degree day. I don't know any horror stories. My sister's husband was about a half hour late for the wedding because they ran out of gas. Everything else went fine. No disasters. Never been married and I hardly ever go to weddings. I love the book cover. A friend's wedding was 45 minutes late in starting because he groom was late. He was so drunk, the groomsmen had to hold him up during the ceremony. They are still married after 20 years.